I don’t know about you but when the leaves come out on the trees here in Central Indiana I don’t think about summer’s near arrival; I think about spending some time out at the Indianapolis Motor Speedway. Friday May 10th was the opening of the IMS and it all started with a classic car driving Tour the Indiana countryside to see beautiful central Indiana and some covered bridges with the final destination being the Clabber Girl Museum in Terre Haute, Indiana. 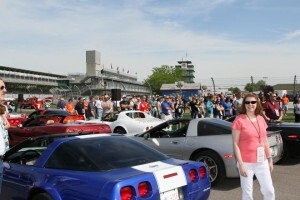 Many of the classic cars then returned to the IMS to take part in the 3rd annual Celebration of Automobiles. The 2013 Celebration of Automobiles was bigger and better than ever before. On Saturday May 11th the Plaza and Chalet area of IMS hosted a car show featuring some iconic classic cars from several eras and over 275 pre 1970 Corvettes will be on display. The event payed tribute to the rich heritage of automotive history at the Indianapolis Motor Speedway. As a special event, Chevrolet brought one of every model of Corvette to the show all in varying shades of white. The completely re-designed 2014 Corvette C7 Stingray was also be on site for attendees to check out and get a picture with the new Corvette even before it hits the dealership showrooms. This debut outing for the 2014 Corvette C7 Stingray is the first public appearance of the car outside of an Auto show. It demonstrates our rich automobile history that General Motors chose Indianapolis to be the first public appearance of this exciting new Corvette. You will also see the new Stingray leading the Indy 500 field as it will be the official 2013 Indy 500 pace car on May 26, 2013. Chevrolet Motorsports will also be at the track with an exciting and interactive display of the whole family to enjoy. The Celebration of Automobiles was topped off with the annual Awards Dinner Saturday evening. The dinner served as the climax for the 3rd annual Indianapolis 500 Celebration of Automobiles. As part of the Awards Dinner, a field of expert judges handed out several awards including the Media’s Choice Award and the People’s Choice Award. First-place awards and other special trophies were presented including a special “Chevy Award” given out to the best classic Chevrolet in the car show. I encourage anyone who enjoys classic cars, the IMS track and the month of May in Indianapolis to load up the family and check out all the events going at the track this month. I hope to see you there! Posted in Chevrolet, Corvette, Indianapolis, Racing, Travel and tagged Automotive, Indy Car, Racing.